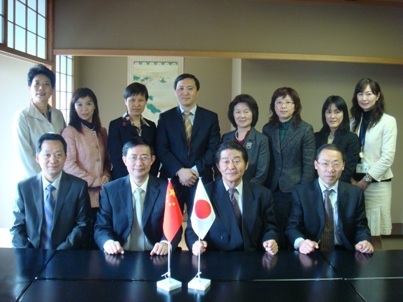 Mr. Huang Zu Hu, Vice President of the Agency for Hygiene in Jiangsu Province of the People’s Republic of China (hereinafter referred to as “China”), and his 6 colleagues visited JICE on April 13th 2012. 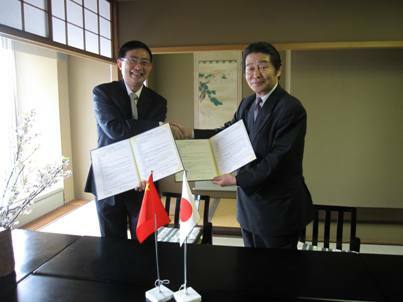 They’ve concluded a Mutual Cooperation Agreement with Mr. Kazuhisa Matsuoka, President of JICE. The content of this agreement includes deployment of doctors from Jiangsu Province to Japanese hospitals. JICE has already concluded Human Resource Development Agreement with Jiangsu Province in December 2010, regarding medical care, agriculture, environment and education. This new agreement is going to be the foundation to get into more details for developing cooperation in the medical field. 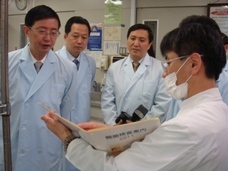 They were informed about the Check-up System for Civilians at SRL Inc, and went on an observation tour in the lab. They also visited National Cancer Center. They had a discussion with 4 Japanese doctors including Mr. Souichiro Shibui, Head doctor of the Central Hospital, and then went on an observation tour in the Center. All the participants from the Agency showed great interest in the advanced check-up technology and medical system. This new agreement is a three-year plan. 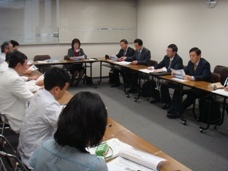 As our first project, 10-15 doctors are scheduled to visit Japan from Jiangsu Province in September 2012, and go through a training program for three months at the hospitals in Japan. JICE is preparing for the program with the support of various hospitals so that this training program for doctors in Jiangsu Province will be a satisfying one.